Proving yet again that Automotive Testing Expo in Novi, MI, USA – now in its 16th year – remains the must-attend event for everyone involved in full vehicle and component-level testing and development, this year’s show saw more than 330 exhibitors display their latest concepts and innovations to more than 5,500 visitors live on the show floor. Among the exclusive technology debuts at the Suburban Collection Showplace was AxialTQ, a next-generation torque measurement device by Interface (Booth 6022C). Featuring a rotor, high-precision sensing element technology and state-of-the-art electronics, AxialTQ was developed in collaboration with end-users who shared their wish-lists for operational priorities, user interface, design, features, real-word field issues and more. Specifically designed for the automotive industry, AxialTQ has the ability to use simultaneous analog and digital outputs to enable real-time control and data collection. Implementation of an axial gap, as opposed to a radial gap, means there is minimized concerned that the shaft, rotor and stator will make contact, significantly reducing the possibility of damaging the system. Elsewhere on the show floor, Kistler (Booth 9036) discussed its recent acquisition of Swiss high-performance measurement technology company SMETEC, which strengthens Kistler’s market position in engine development and research. As attendees discovered, the acquisition will enable Kistler, via precise analyses of the combustion process, to better optimize engine designs and thus meet growing requirements regarding cost-effectiveness and zero-emission operation of combustion engines. Using SMTEC’s technology, processes in the combustion chamber can visualized and statements made on the quality of the combustion process. Meanwhile, Inficon (Booth 11014) ¬– presenting its new XL3000flex leak-detection system for electric vehicle (EV) batteries – used this year’s show to caution attendees on how battery cooling circuit leaks can cause thermal runaway and potentially lead to an explosion or fire that might reach up to 2,012oF (1,100oC). 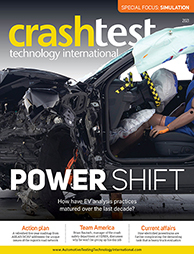 According to Inficon’s North American automotive sales manager Thomas Parker, “the need for modern, high-speed, but accurate test methods has increased dramatically in recent years along with a growing interest in electric vehicles”. He added that robotic leak detection will help solve a number of production-related issues, especially problems associated with EV batteries and gasoline direct-injection engines where test speed accuracy is needed. Another exciting development came from Kratzer Automation (Booth 3006), which has acquired Hofmann TeSys, a German manufacturer and supplier of vehicle test benches, for use in production and research and development. Both companies will initially continue to operate independently under their own names and all current customer projects, supplier and service agreements with continue without interruption. Sibylle Pessall, Uwe Krummenoehler and Otto Kilg take over the management of Hofmann TeSys in Germany. 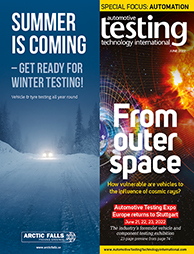 "The proven solutions from Hofmann TeSys are an excellent addition to our range in the field of test bench technology," said Uwe Krummenoehler, member of the executive board for test systems at Kratzer. "We expect the acquisition to generate synergy effects in the areas of purchasing, administration and research and development. We are already interfacing to Hofmann TeSys test stands with our automation and test data management software." Finally, Rohde & Schwarz (Booth 17040) took the opportunity to promote its new partnership with Spirent to provide a test solution offering full coverage of both physical and protocol layers for automotive Ethernet TC8 ECU test specifications. Benefits of the collaboration include a ‘best of both worlds’ approach when it comes to compliance testing and debugging for 100BASE-T1 and 1000BASE-T1. Rohde & Schwarz offers a test solution to cover the mandatory test cases for the PHY layer based on the company’s RTO oscilloscope and ZND vector network analyzer, while Spirent complements this solution by adding its Automotive C50 test platform to support all protocol layers. Attendees of Automotive Testing Expo 2018 in Novi, MI, USA praised the diversity and quality of products on display, as well as the high-level networking opportunities that the expo and conferences presented. “It’s been a positive show, it puts us in front of a lot of our customers and we get to display a lot of our new technologies – flow meters, progressive cavity pumps – to potential customers that we’re not typically able to get in front of, such as GM, Ford and Tier 1s,” said Tony Marsaglia, president, IC Flow Controls.